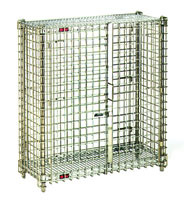 MSC1436 16" x 38" x 40" chrome-plated stationary mini security unit. MSC1448 16" x 50" x 40" chrome-plated stationary mini security unit. MSC2436 26" x 38" x 40" chrome-plated stationary mini security unit. MSC2448 26" x 50" x 40" chrome-plated stationary mini security unit.